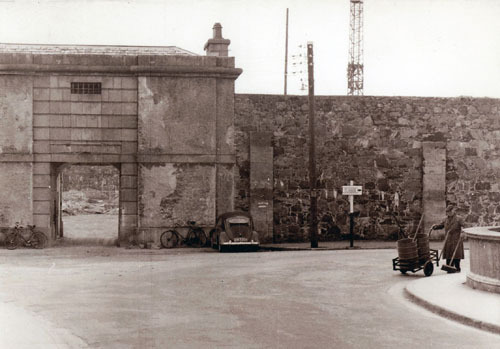 This photograph of the gaol was taken from the Salmon Weir Bridge in April 1958. It looks very bare with no traffic, and that high wall looks very imposing. The road sign we see was pointing to Clifden. The registration number on the Volkswagen car is ZM 3204. Note the bicycles parked at the entrance. The corporation worker with the barrow is ‘Janie’ Carr. As you can see from the crane and the pile of rubble inside the wall, the construction company Sisks had just begun to clear out the space for the building of the cathedral, which of course is on this site today. A correspondent who signed himself ‘Experience’ wrote the following to The Freeman in 1882: “Here is the cell accommodation for the suspects in Galway at present, as I have it on unquestionable authority: - 33 out of the 74 are provided with good cells, ie, cells 15ft by 6ft by about 8ft high, but twelve of these cells are on the ground floor of the prison, where the surrounding walls shut out even that modicum of light and air which the cells on the higher floor enjoy. But how shall I describe the accommodation afforded the remaining 41 suspects? Will your readers believe that the cells in which they are shut up for 18 hours each day are only 6ft by 6 ft, and only 8ft in height? Some are a half-foot higher, some a half-foot shorter but 6ft by 6ft is the rule; and as many as 16 of these cells are situated on the ground floor. The prisoner’s bed, which extends from wall to wall, occupies just half the cell. A small table and chair claim a portion of the remaining space, and the balance, about 3ft square, is devoted to whatever perambulations the prisoner may choose to indulge in during 9 hours out of 18. I once asked a suspect whether his feet never felt chilly and how he managed to keep the blood in circulation in such a small cell. “I place my chair, table, books and clothes on my bed, and this gives me six feet of a walking track, but instead of pacing I foot it, lest I may get a headache from turning too often”. Tomás Bairéad, who was incarcerated there in December 1921, wrote about the jingling of the warder’s keys that never allowed a prisoner to forget his captivity, the death-like stillness that reigned everywhere, even in the stone yard which used to re-echo to the clatter of hammers hopping off the hard greenish granite. There was a wooden hut in the centre from which the warder had a clear view of the occupant of every labour shed. “I used to blow out the gaslight on windy nights, pretend that the wind had quenched it, and ring for a warder to turn off the gas outside. This meant the end of oakum-picking or bag-making for that night.” The execution chamber was above the cookhouse, and always held a strange fascination for prisoners, possibly because it was always locked. Monsignor Considine used to hear confessions in the library, which contained a fire but no seditious books. The stairs and landing had to be scrubbed to austere whiteness before breakfast, while ‘gusts of kitchen’, excruciating to hungry prisoners, came from the cookhouse underneath. William Smith O’Brien wrote his book When We Were Boys in this gaol. Our thanks to Billy Carr for this photograph.